Robert Irwin tells us about his 40-year career as a pharmacist and the motivation behind establishing the Robert Irwin Postdoctoral Fellowship in Pharmacy Research and a major bequest that he will leave to the School of Pharmacy. 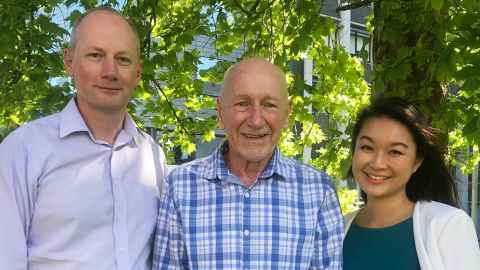 The School of Pharmacy's Dr Jeff Harrison, donor Robert Irwin and postdoctoral fellow Amy Chan. A smile lights up Robert Irwin’s face as he looks back on his 40-year career as a pharmacist. For Robert, pharmacy wasn’t a job, it was his passion. From deciphering doctors’ scrawls to meeting one of Estée Lauder’s sons and attending conferences overseas, he enjoyed it all. “Those are the sort of moments you never forget. That’s the joy of the profession, having those opportunities,” he says. Now retired, Robert will help provide other pharmacists with great opportunities and the chance to advance the profession. Inspired by the benefits it would create, he will leave a major bequest to the School of Pharmacy in the Faculty of Medical and Health Sciences at the University of Auckland. He hopes his story will encourage others to support the school. “I feel privileged to be in a situation where I can help, it’s an investment,” he says. Robert’s career has seen him work in Australia, the United Kingdom and he visited pharmacies and drug companies in the United States. He owned and managed a handful of pharmacies in Auckland, one of which was Pharmacy Two Double Seven, at the Newmarket Two Double Seven Centre, now called Westfield Newmarket. Robert opened that pharmacy in 1988. Thanks to his overseas experiences and previously imparted knowledge from his father, who was the New Zealand Managing Director for Wrigley's Chewing Gum, the business grew rapidly to one of the top performing pharmacies in the country. School of Pharmacy Head Jeff Harrison says he was elated when Robert confirmed he would leave a bequest. “It was a jaw on the floor moment. It was amazing. Our goals are really well aligned. Robert is also partially supporting postdoctoral fellow Amy Chan who was awarded the Robert Irwin Postdoctoral Fellowship in Pharmacy Research. Amy was previously a postdoctoral research associate at the Centre of Behavioural Medicine at University College London. Amy will investigate how to increase the position of pharmacy in the health care sector to optimise medicines-related outcomes and explore where there are needs and gaps in the system. “There’s a lot pharmacists can do to change the face of health care.